Hand study using some water colors and ink. Joe Biden Caricature. Created in Photoshop and Illustrator. Barack Obama Caricature. Created in Photoshop and Illustrator. Some concept sketches done for an iPhone game in the works. Im currently taking a figure drawing course in Grand Rapids at Kendall College of Art and Design partly because I had a hard time finding uninstructed workshops and partly because its always good to have some instructions ;) So far I'm enjoying the class quite a bit. It has focused mainly on the form of the body and experimenting with different methods to get comfortable drawing it. Exercises like contour and blind contour drawings, and a pretty fun one where we had to imagine we were sitting across from where we were actually sitting and draw that side of the model. Last summer I took an anatomy for artists class while I was living in California with Charles Hu at his school 3Kick in Pasadena. At the time, that class was a lot of info, but I'm very glad I took it as it has all started to sink in and is helping me draw people a lot better. Having a better understanding of the major muscles, and proportions has really helped me get over the stagnant point I was at before the class. Its like when I used to play the bass guitar. I didn't sit down and learn a thing when I started, but played mainly by ear. One day someone taught me some basic scales. At first it felt as if I was going backwards with my playing, but once I got comfortable with it, I became a much better bass player. Some of this weeks homework. We had to draw one of the handouts she provided. 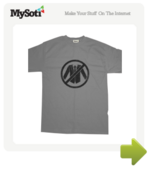 I have posted a new shirt on MySoti.com :) I finally got the last one I made and ordered after about, oh, 5 months of waiting. They were having some problems over there apparently ;) However, I liked the print quality so much, I decided to give them another shot.